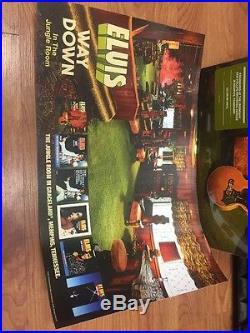 Elvis Presley Way Down In The Jungle Room. RCA 889853181117, Legacy 889853181117, Sony Music 889853181117. 2 × Vinyl, LP, Compilation, 140g. Rock, Pop, Folk, World, & Country. Bitter They Are, Harder They Fall Take 1. She Thinks I Still Care Take 10. The Last Farewell Take 2. Written-By Roger Whittaker, Ron Webster. I'll Never Fall In Love Again Take 5. Written-By Jimmy Currie, Lonnie Donegan. For The Heart Take 1. Written-By Al Jacobs, Jimmie Crane. Written-By Billy Ed Wheeler, Jerry Chesnut. Love Coming Down Take 3. Blue Eyes Crying In The Rain Take 4. She Thinks I Still Care (Alternate Version) Take 2. It's Easy For You Take 1. Written-By Andrew Lloyd Webber/Tim Rice. Pledging My Love Take 3. Written-By Don Robey, Fats Washington. For The Heart Take 4. Manufactured By Optimal Media GmbH BG 38 751-02. Distributed By Sony Music Entertainment. Record Company Sony Music Entertainment International Services GmbH. Mastered At Battery Studios, New York. Mastered At Optimal Media GmbH. Mixed At Sam Phillips Recording Studio. Overdubbed At Young'Un Sound, Murfreesboro. Arranged By [Strings & Horns] Bergen White. Art Direction, Research [Photography] Roger Semon. Bass Dennis Linde, Jerry Scheff, Norbert Putnam. Compilation Producer Ernst Mikael Jørgensen, Rob Santos. Electric Piano, Piano David Briggs (2). Engineer Brian Christian, Mike Moran (7), Ron Olson, Tom Brown (2). Engineer [Director of Engineering] Larry Schnapf. Engineer [Overdubs] Al Pachucki, Brent Maher, Tom Pick. Guitar Billy Sanford, Charlie Hodge, James Burton, John Wilkinson. Guitar, Engineer [Overdubs] Chip Young. Management [Project Director] Jennifer Kirell, Jim Parham. Management [Sony Business Affairs] Tara Bruh. Mastered By [Vinyl Cut] JP (48). Mixed By Matt Ross-Spang (tracks: 2-01-2-17). Mixed By [Mixing Assistant] Wesley Graham (2). Photography By Bobby Klein (3), Derek Phillips, Elvis Presley Enterprises, Inc.
George Hill (6), JAT Publishing, Joseph A. Photography By [Cover] Robert Dye. Photography By [Digipak inner panel left and booklet page 18] David McClister. Photography By [Memorabilia] Chris Giles Sr. Follow That Dream (3), Sony Archive, Sören Szameitat. Piano Glen Hardin, Tony Brown (4). Producer [Associate Producer] Felton Jarvis. Product Manager [Product Director] Tom Burleigh. Product Manager [Product Director], Liner Notes John Jackson (11). Technician [Recording Technician] Roy Schockley. Transferred By [Analog to Digital Transfers] Mike Piacentini. Vocals Dolores Edgin, Hurshel Wiginton, J. Sumner & The Stamps, Kathy Westmoreland, Myrna Smith, Sherrill Nielsen, The Stamps, Wendellyn Suits. Vocals [The Stamps] Bill Baize, Ed Enoch, Ed Hill (2), Larry Strickland. Sealed copies come with sticker stating. Features Newly Mixed Outtakes From The Jungle Room Sessions. Engineered At The Legendary Sam Phillips Recording Service In Memphis, Tennessee. Including an inlay with text from John Jackson. Elvis Presley Enterprises: Robert Dye, Jim Gibb, Gary Hahn, Gary Hovey, Katie Jones, Adam Kronengold, Angie Marchese, Jamie Salter, Jack Soden, Jen Swearingen, Joel Weinshanker, Nick Woodhouse. Thanks to David Briggs, James Burton, Sharon Corbitt-House, Halley Phillips, Jerry Phillips, Jud Phillips, Knox Phillips, Norbert Putnam, Ronnie Tutt. Very special thanks: Priscilla Presley. Sony Music Entertainment International Services GmbH, PO Box 510, 33311 Gütersloh, Germany. CONDITION RATINGS : G / G+ / VG / VG+ / VG++ / EX / EX+ / NM / NM+ / MINT. You may request the results of a play test. 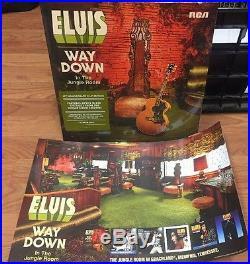 The item "Elvis Presley Way Down In The Jungle Room SEALED 2xLP & RARE LITHOGRAPH PRINT" is in sale since Tuesday, December 06, 2016. This item is in the category "Music\Records". 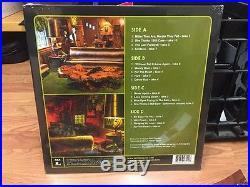 The seller is "lovevinylrecords" and is located in Denver, Colorado. This item can be shipped worldwide.